When the unexpected occurs in a packed metropolis such as Los Angeles or Orange County, prompt emergency traffic control is crucial. Little surprises such as burst water pipes and power outages are guaranteed traffic-stoppers. The snarls and tangles stretch for miles, and with every second that ticks away, the snarlier and nastier things get. 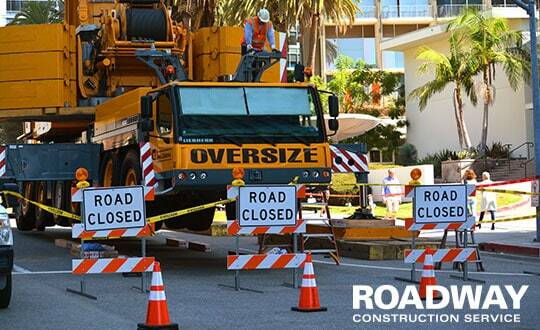 Fortunately, when these tense situations arise, Southern California can rely on Roadway Construction Services (RCS) for prompt 24/7 emergency traffic control services. RCS knows that emergency situations demand rapid response. Given this need for quick reflexes, we staff our control center with a team of live personnel ready to field all calls for help. Pre-recorded messages and answering services … not in our camp. Never has been. Never will be. When we say emergency traffic control supported by live personnel, we mean it. That’s 24/7/365. The second a call comes in … no, make that nanosecond, our emergency team starts planning a response. The overriding concern during this stage is minimizing damage and maximizing available resources in the shortest time possible. Coordination with contractors to develop a plan of action and deploy needed equipment and crews. This process extends well beyond our borders. RCS coordinates its efforts with all applicable entities to maximize plan efficiency. These entities may include organizations such as city governments and agencies, Southern California Edison, and the local gas company. Everything works together. When a pipe burst at a Newport Beach pump station, water flooded the streets and everything else in the vicinity. Once RCS fielded the call, we crafted the impossible plan, dispatching repair crews and equipment to the flooded areas in one hour! As vehicles speeded necessary equipment and gear to the water pump station, RCS handled all emergency traffic control duties including lane and road encroachment, as well as traffic flagging to guide pedestrian traffic. This was particularly challenging, as abundant pedestrian traffic (including bikes and dogs) was flowing to and from the nearby beach. RCS also handled the closure of a well-traveled ramp at Pacific Coast Highway. Despite these monster challenges, the RCS team kept things smooth and orderly throughout the entire two-week repair period. Providing 24/7 emergency traffic control is one example of how RCS safeguards Los Angeles and Orange County in times of need. If you’re interested in learning more about our emergency traffic control services, call RCS today at (855) 907-7233. You’ll discover why we’re the go-to traffic control service in Los Angeles and all of Southern California.